Every Friday, after a week of lessons in math, history and science in front of whiteboards, the students of Sitka’s Pacific High School trek beyond the four walls of their classrooms to Sitka National Historical Park. There, they learn how to carve traditional paddles just as indigenous Alaskans to have done in Southeast for thousands of years. The wood shop in the park’s Cultural Center is quiet. Stop by and you won’t hear buzz saws or belt sanders. Instead, you’ll hear a silent group of students carving away at slabs of wood. 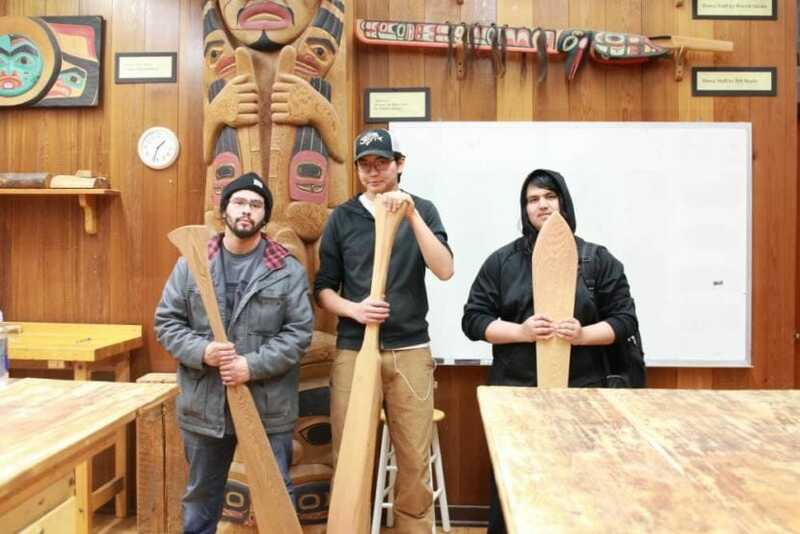 They’re making traditional Alaska Native paddles. Their focus is on their craft. Pacific High School senior Daniel Abril said it’s a time for him and his classmates to quiet their minds. The walls of the wood shop are lined with works by well-known carvers like Bill Brady and Harold Jacobs. Sophomore Eric Alvarado said the dance staffs, masks and other carvings displayed on the walls make him want to create more, maybe something like a totem pole. Mark Sixbey is the education specialist of the Sitka Tribe of Alaska. 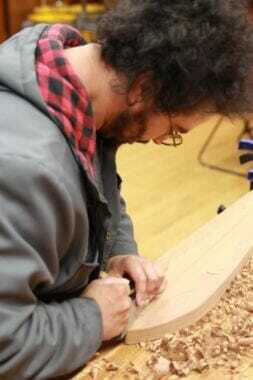 He teaches the carving class through the Sitka Native Education Program, a partnership with the Sitka School District that aims to preserve and promote cultural education among students in the district. He also teaches a similar class at Blatchley Middle School in conjunction with shop teacher Karl Jordan. This class is one example of the Tribe’s long history of passing culture on to new generations, Sixbey said. It’s not uncommon for students to fall into silence as they carve chips of wood away, Sixbey said. It’s the nature of hands-on work. Some of the beauty of this class, on a very basic level, is that it comes on Friday afternoon, Matt Groen, a Pacific High social studies teacher who carves alongside his students, said. “When a lot of people are staring at the clock and waiting for the weekend, it gets tools in their hands and it gets an actual physical project for them to work on,” Groen said. This class is emblematic of the unique environment where Pacific High School students learn. Regular classes only run Mondays through Thursdays. Every Friday, students are given an opportunity to explore career options through classes taught by community members in Sitka. This carving class is more than a therapeutic art class for his students, Groen said. Teaching traditional arts like paddle carving is important for the preservation and growth of Alaska Native cultures. But this class also helps students find confidence within themselves, Sixbey said. The amount of time and effort demanded by this art form is high. Sophomore Eric Alvarado said it made him realize how much work was put in to totem poles around Sitka. But he and his classmates say they’re eager to carve more.